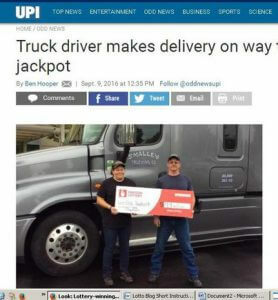 When a truck driver came to collect his lottery jackpot, he brought his rig along. He did not do it because of the size of the prize, but because he dropped off a load of drywall on the way over. This is the first time for Eric Tackett to win big, so he found it hard to believe he had won $9.4 million, but everything checked out. He later chose to receive the prize in a single payment of about $3 million net of taxes. The TA Truck Stop in Coburg earned a bonus of $94,000 for selling the winning ticket.